The last event of The Jamzu Daily Double 2 series on Touch Arcade was the open round of the Thursday Triple Twist. Several players had entered moves via PM in the first round, but no one had gotten all three positions correct. The Triple Twist turned out to be an epic battle between the two top players from the JDD 2 series, TheSporkWithin and Khamous. Each had won two contests in the JDD 2. POSITION ONE Red to move with a six. - Fully opens lane 6 for Red for a maximum long move. - Stops Blue in lane 6 from scoring. - Unblocks runner that's furthest behind. - But doesn't open any lanes for Red. - Can do this kind of move against Blue in lane 5 later easily. POSITION TWO Red to move with a six. - Starts unblocking Red's most vulnerable runner. 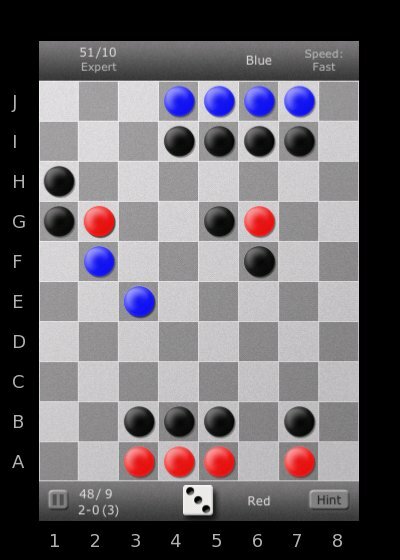 - Red can continue, in next moves while he controls lane 2, to attack Blue with the E2 and B2 jammers. - Stops blue from scoring in lane 6. - Opens Red for a max run in lane 5. - Blocks Blue in more tightly on the starting position in lane 5. - But leaves open Blue for a score in lane 6. - Also does not help Blue's most vulnerable runner at A2, which is quickly becoming trapped. If Blue further attacks Red in lane 2 with the I3 and I5 jammers, Red could be in very serious early trouble here. B5-H5 is a strong move, but G2-C6 is overall better right now. POSITION THREE Red to move with a five. - Opens Red in lane 4 for the longest possible run and even a score. - Red's runner in lane 4 is also most vulnerable to a counterattack by Blue from the D7 jammer, so giving him a chance to escape now is best. - Clears the H4 jammer as far away from Red's runners as possible. Blue can't easily flip the jammer back again to attack Red. - Total block switch, also opens lane 4. - But leaves jammer on G3 in place to harass Red on lanes 2, 4, 6 or 7. - Makes it harder to clear H2 jammer out of the way in lane 2. 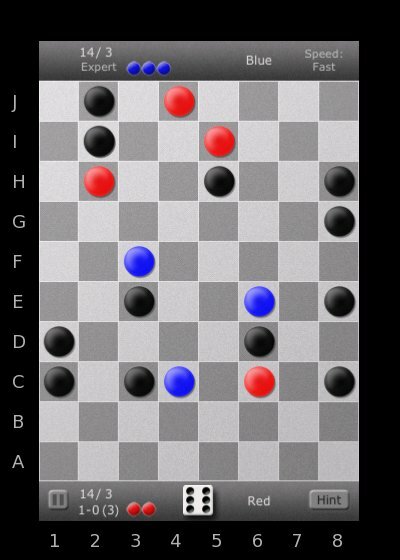 Red could use H2 to attack Blue in lanes 3 or 7, but only if G3 is clear. - Very similar to, and probably equal to H4-C7. Possibly slightly better. - But doesn't open runner in lane 4 for escape and max possible run. - Jammer on G3 can be used against Red again in lanes 4, 6 or 7. - Better to do H4-C7 or H4-C3 first, and then this if you have the chance. - Probably even better than H2-G3 in that is gets the jammer further away from harassing Red. After PM'ing the players with their results from round one, I started the open round. Both players now knew they had the correct answers for positions one and two. The final contest would be over position three, the toughest position of the Triple Twist. Spork and Khamous both came back lightning fast with identical guesses for their next shots, with Spork's PM coming just seconds ahead of Khamous! 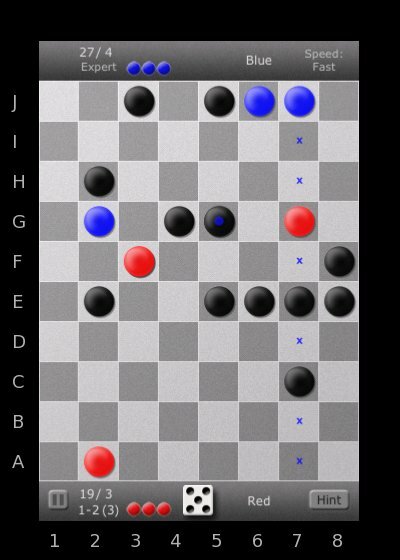 But both made the same wrong guess for position three, trying H4-G3. I PM'd the results again. This time, Khamous came back first with the next shot. He *almost* had the correct move, guessing H4-E7. About 20 seconds later, Spork landed his killer blow, taking the longest possible move with the H4 jammer, and nailing H4-C7! TheSporkWithin took First Place in the Triple Twist, in what couldn't have been a closer or more hard fought battle with Khamous. Super congrats, Spork! Spork won a $25 iTunes Gift Card for his First Place finish. 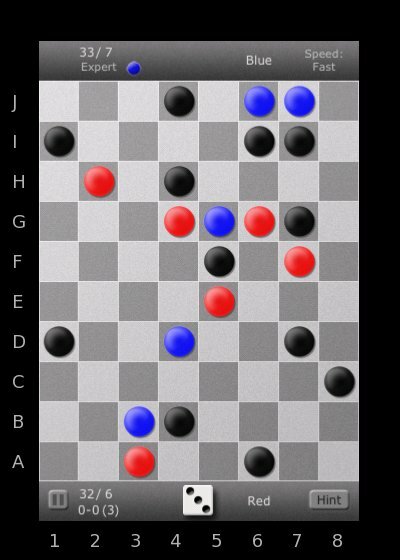 From all the initial entries in the first round of the Triple Twist, only Kevd had actually spotted the correct H4-C7 for position three, along with his other correct guess for position one. For the Second Place prize, the entries were selected from the remaining players who had submitted at least two out of three moves correct in the first round: Kevd, haffertee, and cathy. Cathy won the drawing, and took the Second Place prize of a $15 iTunes Gift Card. Congrats, cathy! The fifth and final day of The Jamzu Daily Double 2 series on Touch Arcade brought a rare Daily Double where not a single player got even one move correct in the first round. This is the first time that's happened in the JDD competitions! POSITION ONE Red to move with a three. - Stops Blue from scoring in wide open lane 2. - Opens lane 3 for Red, while also giving Red a shot at the jump in lane 3 if Blue does not score on his next turn. - Allows the Red runner in lane 3 a chance to escape before Blue starts trapping him with moves like I4-H3, I5-G3, etc. - Yes, this move does allow the Blue runner in lane 3 to score. But if you don't block lane 2, you're allowing that runner to score anyways. Allowing Blue off in lane 3 now is fine, as this lane is only going to become a liability for Red if he leaves the runner on A3. Use the roll of 3 to both stop Blue in another lane, open your runner's lane, and prevent longer-term damage where Blue would otherwise try to trap you. - Does not stop a potential attack on A3 by Blue. 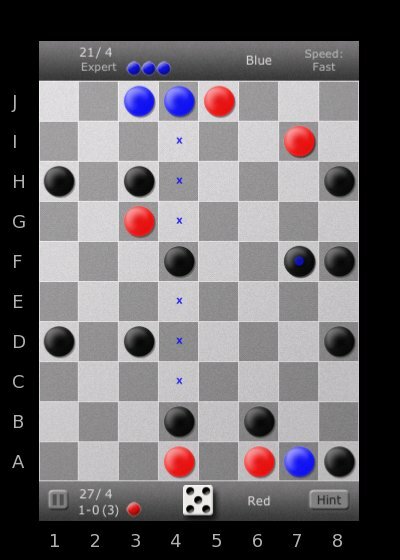 - Similar to B3-E2, with partial block switch, and benefit of allowing Red to move his A3 runner before it gets trapped. - But doesn't have the benefits of stopping Blue in lane 2. - Opens Red for a long run in lane 7. - But doesn't have any of the other benefits of B3-E2. - Opens Red runner while keeping the block on Blue in the same lane. - Takes control of lane 6 for Red, preventing any damage from the jammers at C3 or E3. - By keeping the block on Blue in lane 6, you don't open Blue for his longest possible run in lane 6, which could include a jump! - Does block Blue's C4 runner from scoring, and does take control of lane 6 for Red. - But does allow Blue both a shot at long run, with a score and a jump, in lane 6. This would allow Blue a chance to get way ahead in the race, which right now is very even. The tricky element with these two positions was the fact they both had moves that were good, and very close, to the best. After sending out PMs that all said the same thing ("none correct"), I wondered if we'd have a contest that would go all the way to the third round. Only a couple of minutes after I gave the GO! for round two, Khamous put that idea instantly to rest, with the correct answers for both positions! Congrats, Khamous on a second win in the JDD 2 series! With two wins apiece for TheSporkWithin and Khamous, we now had the open round of the Triple Twist coming in just half an hour. Would there be a tie-breaker win between these two players for the final victory of the JDD 2 series? I had no idea what an insanely close battle was about to commence! For Day 4, The Jamzu Daily Double 2 on Touch Arcade featured two positions with rolls of 4, and two jammer moves as the correct answers. POSITION ONE Red to move with a four. - Helps unblock Red's vulnerable runner in lane 6. - Takes control of lane 6, allowing another potential move where Red could both free himself while counter-attacking Blue in lane 3. - Keeps Red ahead in the block count, 4-2. - The Blue runner on E6 is a good as gone. Blue weaknesses are his lane 2 and 3 runners. Red's C6-A2 attacks those weaknesses while simultaneously improving both his position and advantages. - This does give Red control of lane 6, and stops Blue from moving to D6. - But does nothing to ultimately help Red get free. - Red is going to have to get the B6 and C6 jammers out of the way. Moving B6-D6 like this does not really get Red anywhere, and wastes a valuable tempo. - Red needs to get out of his trap in the way that maintains or improves his advantages. C6-A2 both helps Red free himself, and increases his advantage in blocks. POSITION TWO Red to move with a four. - Blocks Blue in his wide open lane 5. - Opens Red in lane 7 for a move off. - But not necessary now. F2 is in no danger of being blocked, and can move forward later. - Not good timing for this move. Khamous was up first with his guess, but missed on both boards, going for the deceptively appealing F2 run in position two. cathy struck just a minute later, with the right move for position two, I7-E5! There was a two minute pause, and then TheSporkWithin came into the game, striking gold with the best move for both positions! C6-A2 was the correct answer for position one. Congrats, Spork! After the contest was over, Spork said "Nice, my 5 minute bathroom break tactic paid off!" and revealed that the only way he was able to play was by excusing himself for a moment from a family event to enter the contest by playing from his phone! An extra bonus point to Spork for pulling off this tricky maneuver to win the contest. Khamous and I got into a lengthy discussion of the merits of C6-A2 vs B6-D6, but I'll leave the analysis above as the final word for now! - Blocks Blue where he currently has a wide open lane, preventing a potentially long run by Blue. - Takes control of lane 6. Red could then continue to free his lane 6 runner with a move like B6-C5. Or he could keep attacking Blue in lane 4, with something like I7-H4. - These are all good moves in different ways that are very similar to the best move, but missing the best possible way to block Blue at I4, and the really nice block switch that G6-I4 provides. POSITION TWO Red to move with a one. - A critical defensive move by Red! This prevents D4-G3, D4-H4, D4-I5 or D4-J6 by Blue. Any of these moves would be a total block switch by Blue, hurting Red in blocks where he is already behind. 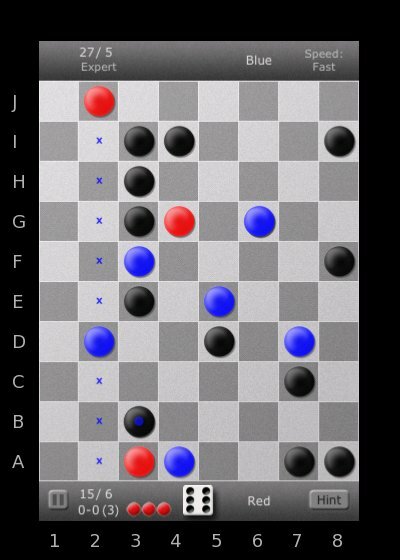 - Really the only move the helps Red at all, but it helps tremendously by blocking a potentially killer move by Blue. 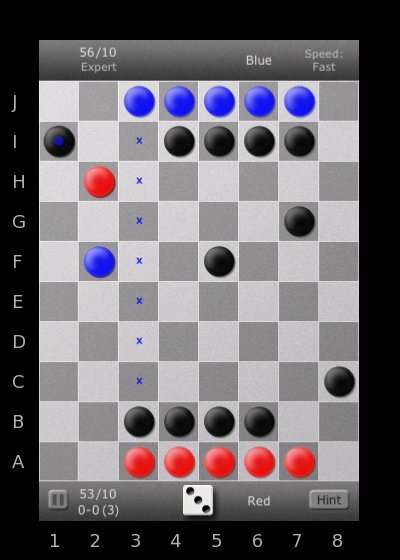 - G2 is actually dangerous for Red, allowing the moves C4-H3 or C4-I4 by Blue, both total block switches. - D5 and G6 don't have any advantages like F3. Khamous was first to strike, with cathy and haffertee coming in with guesses right behind. But none of these players had posted a correct move. A couple more minutes passed, and then TheSporkWithin finally struck, nailing the tough-to-see move in position one, with G6-I4! Khamous posted that he thought Spork had won it with this guess, but I don't think any of the players yet suspected what was hidden in the ultra-devious position two. When I waited a couple more minutes to call round one, everyone caught on that the right move for position two had not yet been posted, and the suspense got very intense for the start of round two! Finally, after sending out the PMs, I gave the GO! for round two, and Khamous and Spork both posted almost instantly with the correct answer for both moves, with Khamous edging out Spork by a microsecond with the correct guess of F3 for position two. These two posts were so close, and the reason for F3 was so important, that I made a quick decision to have a tie-breaker for the day's contest to make sure luck wasn't the deciding factor. I asked both Khamous and Spork to PM their reasons for F3 in position two. After the first PMs were in, it was clear that Khamous had absolutely nailed the best reason for F3 and Khamous was crowned the winner for Day 3! Khamous' perfect logic for F3, which he was able to write quickly under the intense pressure of the PM tie-breaker, was posted in the thread for all to see. Super congrats, Khamous, on a killer win! The first day of The Jamzu Daily Double 2 on Touch Arcade featured two positions with tricky jammer moves, two players with lightning fast correct answers, and a new winner in the JDD series! POSITION ONE Red to move with a five. - Creates a completely open lane for a good run. - Takes control of lane 6 to allow Red's most vulnerable runner a chance to escape before it gets further blocked. - Doesn't allow for a run of more than 4. - Allows Blue to attack lane 6 with something like F4-D6. POSITION TWO Red to move with a five. - Red is behind in blocks, but ahead in the race. This move puts Red ahead in the block score. - But Red is well ahead in the race, and neither of these runners is in any danger of being blocked, so no need to do these moves now. TheSporkWithin, taking a brief moment away from World of Warcraft, came in blindingly fast, and first, with both correct moves! B6-C3 for position one, and H3-C4 for position two. Big congrats to TheSporkWithin! Just a step behind, seang also had the right moves for both positions. I was shocked at how fast these two players had gotten these moves, with the move in position one, I think, being especially hard to spot. 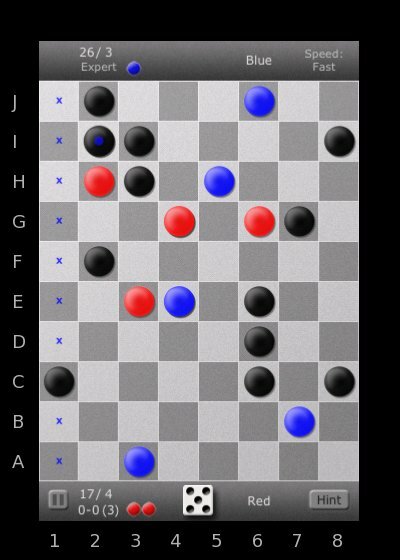 Khamous, the Champ from the previous two contests, came in with the first answer, but only one correct move at H3-C4. Haffertee also came in with both correct moves in the first round, and just a couple of minutes after Spork's winning guess. The first days of the Jamzu Daily Double 2 was fantastic, with a new winner, and the players showing extremely sharp skills in an intense and fast contest. In order to keep the robots and spammers at bay, I need to approve all new forum memberships in advance. with your forum Username only (no passwords please), and I will make sure your membership is approved. If any members see spam activity anywhere on this forum, please notify me at the above email, and the offending account will be deleted. The fifth day of The Jamzu Daily Double on Touch Arcade featured two challenging positions whose best moves had a similar theme - blocking Blue in an open lane. - Unblocks Red and blocks Blue. - Opens lane 4 for a potential good run or move off. - Blocks Blue, in the most effective way possible, in lane 6, where he is threatening to make a long run. 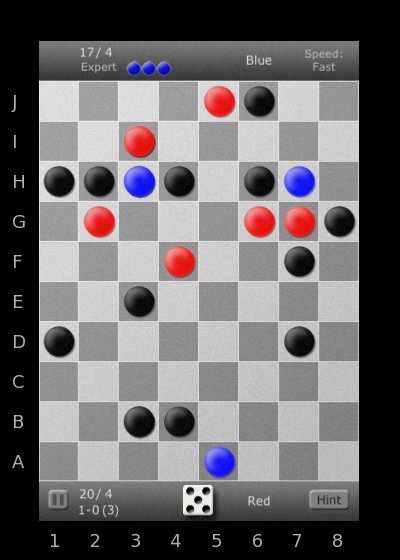 - The E6 block will be very hard for Blue to flip back against Red. - Does unblock Red and blocks Blue. - But does not open any lanes for Red. - Easy for Blue to flip this block back to Red with B5-D3. Blue couldn't do this as long as you controlled lane 3, but there is no need to force yourself to do that right now. - Better to pass on H3-B5 right now. 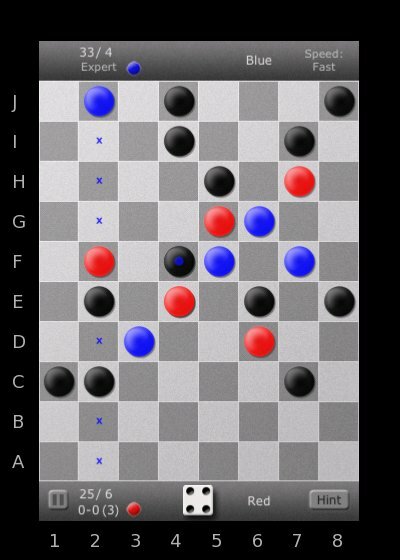 Instead, do I4-E6 first to stop Blue in lane 6 as much as possible, and if you get the chance later, then do H3-B5. - This opens Blue in lane 3 too much and too early. - Blue's lane 5 runner is already blocked, not much gained with this. - No open lane for Red. - Leaves lane 6 wide open for Blue. - Blue can move ahead in lane 3, and even block behind his lane 3 runner with the D5 and C7 jammers if he has the chance. - Blocks Blue from making a run for it in lane 2. - G1-H2 blocks Blue the tightest, but also bottles up the I3 jammer a bit for Red. - G1-F2 blocks Blue partially, but does allow the possible follow-up of I3-H2 if Blue doesn't get past I2 in lane 2. - Overall, these two moves are equally good. - This does open lane 7 for Red. - Better to wait for something that would allow you to block Blue in lanes 2, 3 or 5 with this jammer. 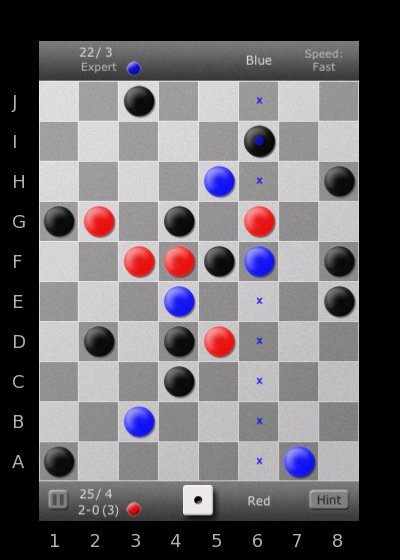 Really, only G1-H2 or G1-F2 is a good move for Red in this position. This time up, CzarCastic struck hard just a couple of minutes into round one, with the correct guess on position one, I4-E6. Several players, including previous winners haffertee and Khamous, went for the more obvious, but incorrect, H3-B5 with their first guesses. 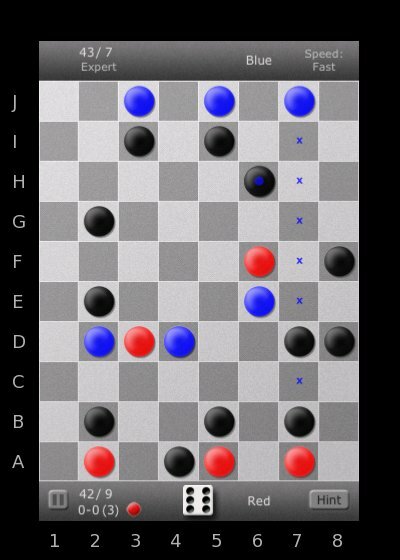 No one, however, saw the best move G1-H2 for position two in the first round. After I PM'd the first round players with their results, I opened the second round. With the move I4-E6 out of the bag, I had a feeling the win would happen quickly. Sure enough, haffertee and Khamous were like lightning with correct guesses in the second round. Khamous managed to barely edge out haf on the clock, taking his third victory in the Daily Double series! Khamous proved his Jamzu Move Champion 2010 title was well-earned. The first series of the Jamzu Daily Double was a total blast, and we want to send out a huge "thank you!" to everyone who participated in these challenging contests. The fourth day of The Jamzu Daily Double on Touch Arcade was a another wild day! The position I thought would be harder turned out to be guessed pretty quickly by a couple of the players, and the one I thought would be easier actually turned out to be quite tricky! - Opens lane 3 for a potential good run. - Really the only good move Red has here. - The only other decent option to block Blue with a 5. POSITION TWO Red to move with a three. - Take the opportunity to get Red runner A3 advanced with a jump. 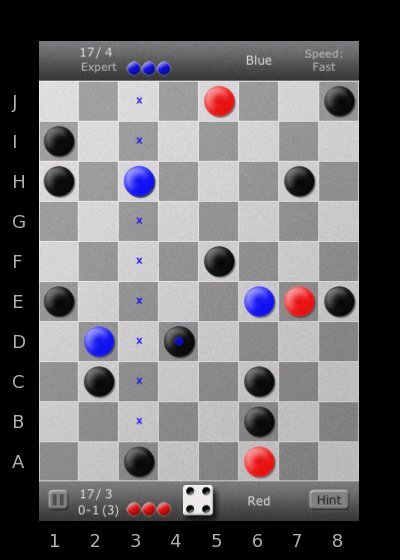 - If you don't move A3 now, Blue could trap him with the blocks B4-C3 or F5-D3. - Gets most vulnerable Red runner advanced at a good time, while Blue is blocked up pretty well everywhere already. - Not necessary now. H2 is in no danger at all of being blocked. - But opens lane 5 for Blue, and with an easy jump! Better to wait for something like F5-D5 here. - Unblocks both Red and Blue, and blocks Blue behind Red in lane 6. - But would be better to do something like G7-E7 with this jammer. - A3 is more important to move now, then work on keeping Blue bottled up in lanes 6 and 7. This time cathy and Khamous both guessed the twisted jammer move in position one very quickly. I didn't think this would be quite so easy to spot, but they were right on it! However, in position two, the intuitively more obvious move of A3 just sat there, with nobody daring to believe that could actually be the right move! 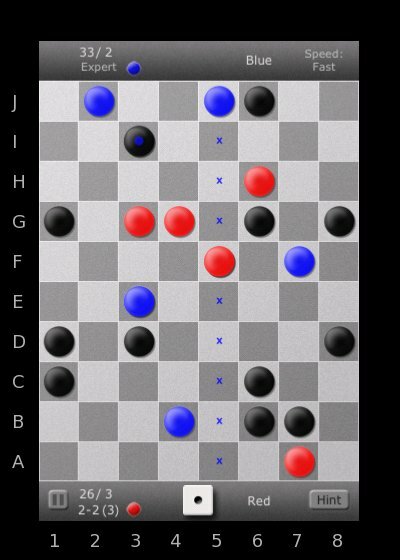 After a few minutes of tense waiting to see if anyone would make the post with both moves correct, I closed the first round. When I opened the second round, I thought for sure the winning post would come instantly, but still, for a couple of minutes, A3 was passed by in the first posts. Haffertee, who chose to play from the sidelines this time, wondered aloud "what happened to Khamous?" There was no quick guess from Khamous when the second round opened. The moment after hafertee posted the question, Khamous came back with the answer: The best moves for both positions! Khamous had decided to take a longer moment to reflect on his second round choices. His extra thought paid off, and he came in for the win. Congrats, Khamous! The third day of The Jamzu Daily Double on Touch Arcade started out with some light banter, as the contestants wondered if the positions would be as tricky as Day Two, and also if they'd see a new winner besides haffertee or Khamous! - Unblocks Red in lane 3 for a potential good move off. - Blocks Blue up more where he is vulnerable in lane 6. - You'll still likely have a good chance to get the jump on Blue in lane 7 later. - Kind of a waste of the 5 roll. 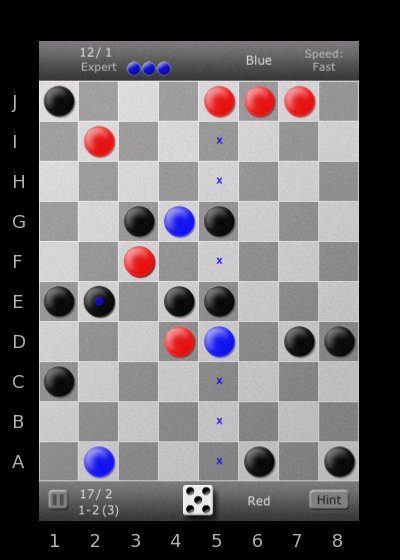 - Moving E2 definitely too dangerous, letting Blue free too early, or even allowing him to move off immediately with a 6. - Wait for potential better move for H2, like H2-H6, or even H2-G7 if you get G7 off soon and Blue runner 7 is still in the back rows. - Follows the fundamental opening game principle of getting your runner lanes open, while blocking simultaneously if you can. - Fully opens lane 3 for Red, for maximum possible advance. - If Blue advances next in lane 3, Red could have a good shot at the jump. - Stops Blue cold in lane 2, where he is wide open for a good advance or move off. - Having a Blue runner blocked at F2 makes it more problematic for Blue to get his I5 jammer out of the way. - Not necessary now. H2 is in almost no danger of being blocked any time soon. 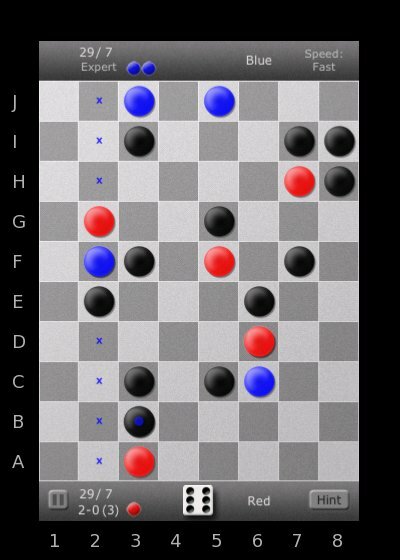 If Blue should try the lone block of F5-I2, not only would he be wasting a good lane opening move, but Red could easily use the I2 jammer right back at Blue. - Does advance a runner somewhat in the opening game. - But would be better to use a 4 or 5 to advance in lane 7. - Does not accomplish nearly as much as B3-E2. - Does not open any lanes for a following high roll runner advance. Well, the positions this day may have been a bit clearer, but we did have a repeat winner! The lightning fast competition saw seang make the first post, finding the tricky rebound in position one instantly and coming extremely close to nailing the second one as well! Only a minute later, haffertee jumped in with both correct moves! 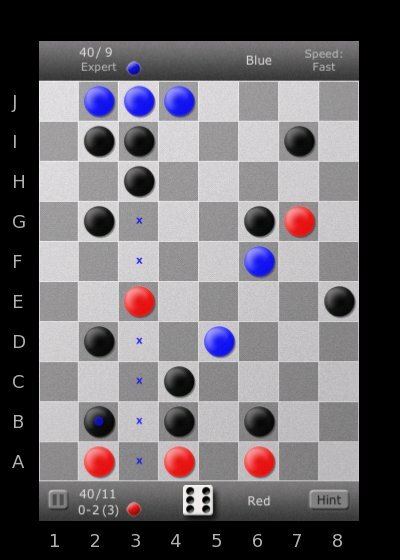 Both moves were seen within the first minute of the competition, just not by the same player. This time Khamous was the first player to see the right move for position two, but he missed the more tricky position one move. This day was a contest that rewarded very quick thinking under pressure. Several players almost had it right off the bat, but haffertee came through for the win! Congrats, haffertee!